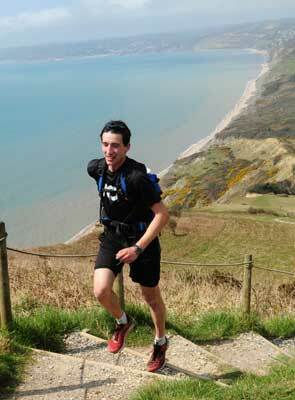 The VO2 Oner 2013 took place April 21st along undulating coastline in the South west of England. Founded in 2007 this run over classic terrain has checkpoints approximately every 6 miles and a cut-off policy for those not sustaining an average of 3 mph. The route starts at Shell Bay, Studland, then up to Old Harry Rocks – one of several famous landmarks the path passes eventually reaching the seaside resort of Weymouth. The final section makes its way along Chesil Beach, Golden Cap and the descent to the finish line. This year there were 29 starters and 22 finishers. Marathon man Adam Holland took on the ‘Oner’, described as ‘the mother of all ultra trail runs.’ The race is a triple coastal marathon over the Jurassic coast path along Dorset. But the competitors had 24-hour time limit is imposed on them. The runners also have to self navigate the path along the coast, running through the day and night. Although it is described as a triple marathon, the distance covered by the athletes is more like 80 miles. Adam started the event at noon on Saturday, and finally crossed the finishing line at about 5am. He said: “it was great to take on the Oner again, I wanted to prove to myself that I could run the whole thing this year without having a kip in the event. Toward the end I was getting tired, but did go all the way. I took a bad fall and got very muddy from it, but it was not going to stop me from finishing the event” Adam’s time was 17hours 21 minutes and was 1st back to the finish. That was over 4 hours faster that last year. Visit www.theoner.co.uk for details of the 2014 event.